An overflowing crowd filled the huge sanctuary of Mount Moriah Baptist Church on April 30 to salute the spiritual leadership of the Rev. 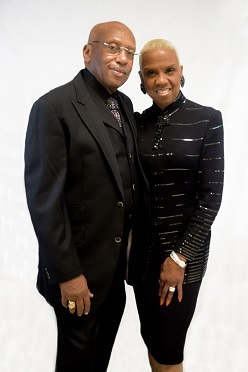 Dr. Melvin V. Wade, Sr., and Lady Jacquie G. Wade. As one of L.A.’s leading ministers, Wade’s 42nd pastoral anniversary celebration united hundreds of people from all walks of life including ministers of all faiths, community leaders advocating varied causes and elected officials representing diverse districts. They came together to honor a man with a decades-long history of reaching beyond spiritual, philosophical and physical barriers to make a difference in the lives of his congregation and the greater Los Angeles community. With Wade announcing earlier this year that he would retire in September 2017, the occasion marked his last recognition as pastor of Mount Moriah. In light of that fact, church members planned a series of worship services during April to acknowledge his ministry and community contributions. The theme was “Our Pastor Finishing His Course with Joy” based on 2 Timothy 4:7. Vickie Ward and Jovonne Lavender served as the event chairpersons and Horace Hall was the honorary chairperson. Some of the nation’s most renowned preachers participated in the celebration. On April 9, Pastor T. Ellsworth Gantt II of Second Baptist Church in Riverside and the brother of Lady Wade delivered the sermon. The Rev. Dr. R. A. Williams of McCoy Memorial Baptist Church in Los Angeles brought the message on April 23. The morning service on April 30 featured the Wade’s son, Pastor David L. Wade of Mount Calvary Baptist Church in Mesa, Arizona, who appeared with 100 of his members. The commemoration concluded that afternoon with preaching by Bishop Kenneth C. Ulmer of Faithful Central Bible Church in Inglewood. Expressing his appreciation, Wade said, “How hard it is to be succinct and compressed about our 42nd Anniversary. However, I will say that it was under the anointing of the Holy Spirit.